I've tried a few more clothing items recently. I'm definitely learning from experience. 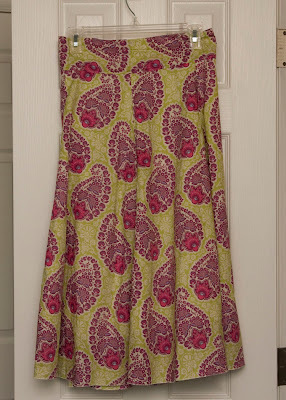 First off there is my skirt from my Heirloom fabric. I loved this skirt made from the Study Hall pattern by Anna Maria Horner. 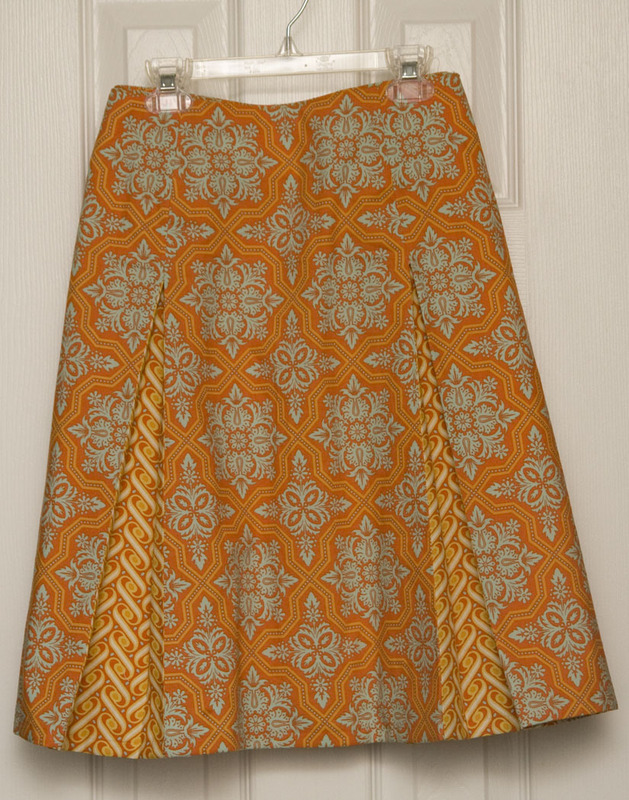 Rather than investing in a new pattern, I decided to wing it and just alter the pattern I previously used for another skirt and add the pleats. The pattern pieces already had vertical lines for ribbon embellishments. I just sliced the pattern down those lines, added seam allowances and sewed the pleats (both front and back). I also moved the zipper to the side rather than the center of the back. I was really happy when it all came together pretty well, although it's a bit too big. One of these days I'll take it apart and take it in a bit. My next experiment was a shirt. I used this shirt pattern from Lila Tueller with pretty significant alterations. I used some voile from the Innocent Crush line. I officially love voile. I also love the shirt. It's as comfortable as a t-shirt, but looks more dressy. I did a few rows of shirring around the waist, but I actually just prefer to tuck it in to my favorite denim skirt. Then, I made this shirt from the same pattern. I made the sleeves an inch longer and used a casing with elastic thread around the neckline. I didn't do any shirring around the waist. I like this version much better. 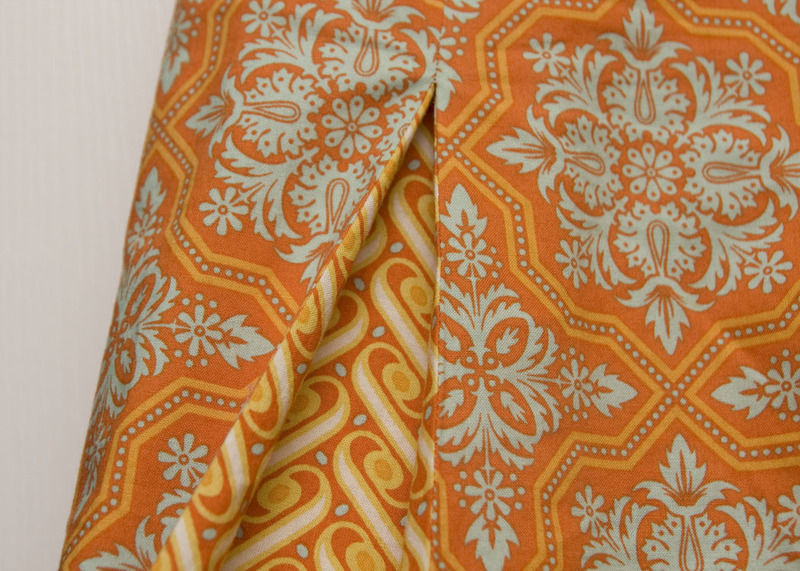 This is also with voile, but from the Heirloom line. I did a rolled hem around the sleeves and waist. The waist tends the curl a bit after being washed, but doesn't seem to be a problem. Finally there is the Heather Ross Weekend Sewing Wrap Skirt that wasn't. As I was putting it together I couldn't figure out how it was all going to work. It only called for 6 panels and just didn't seem big enough to wrap around me. When I tried it on for the first time after sewing the panels together I knew something was wrong. I just couldn't figure out what. I reread the pattern a number of times and couldn't figure out where I went wrong. I finally gave up and decided to sew all the panels together into a normal skirt and added a zipper. Luckily the skirt fit just fine. I went that direction instead of trying to figure out how to keep it appropriately wrapped around myself (which would be impossible). This skirt requires the joining of at least six panels, not five. For size 10-14, add two panels. For sizes 16-20, add four panels. For each panel added, make the waistband ties eight inches longer. Once your panels have been joined, test them by wrapping them around your waist. Then do the same with your waistband. Then attach your waistband to your skirt." I should have added two extra panels to the skirt. That would have made it an actual wrap skirt. The first edition of the book neglected to include a lot of necessary information. As is, it works. I'm very thankful because I would have been ticked if I had wasted all that fabric on a glorified hospital gown. I'm starting to get the clothes-sewing bug. This is making me more and more excited about Sewing Summit coming up in October. I've registered for almost all the clothing classes offered. I can't wait to learn tricks to make this whole process easier. I feel so lucky to live in Salt Lake which makes it very easy for me to attend. I also can't wait to meet so many fabulous people who are coming in to attend. It's going to be a fabulous weekend. Wow, Kati! Great clothes! I especially like the study hall skirt and AMH voile shirt. And thanks for the reminder to always check for pattern errata! Great job! I love them all. You will be the best dressed person at the conference. Wow! All the clothes look great! I especially love that heirloom skirt, the pleats look fantastic! And both of the shirts are wonderful, I've never worked with voile, but think I need to try some! Also so so jealous of attending the sewing summit, I'm sure it will be an amazing time! You will laugh when I tell you that I almost bought the same heirloom print in voile to make the same pattern last week. I ended up buying a different heirloom print. I'd probably have made the shirt last week, but fabric.com sent me the wrong fabric. I didn't think that the green cotton with old fashioned sleds that i received would have looked that great as a shirt! You've been busy! I love the Heirloom prints you chose for your new clothes, and I especially love your AMH voile top! I LOVE your take on the study hall skirt! It is absolutely gorgeous. You are one talented lady! Very cool! I started out as a garment sewer. It's so incredibly rewarding to wear a totally unique, handmade item, and even better to get compliments on them :-). Glad you stuck with it! My mom used to make tons of ultra-cute matching boy/girl outfits for me and my twin brother! Thanks for sharing! 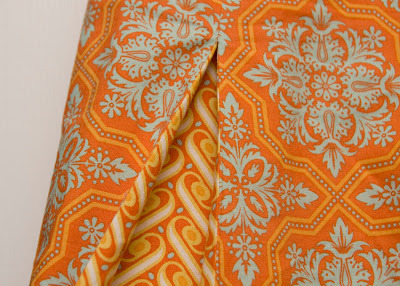 I love that orange skirt -- brave you to slice into a pattern and make it your own! I really like the fabrics you chose -- it looks like an easy skirt to wear. BTW -- I love your Christmas tree pillow -- is there a tutorial in blogland? Sorry to assume a free tutorial -- if not a tutorial, a patten I could buy? 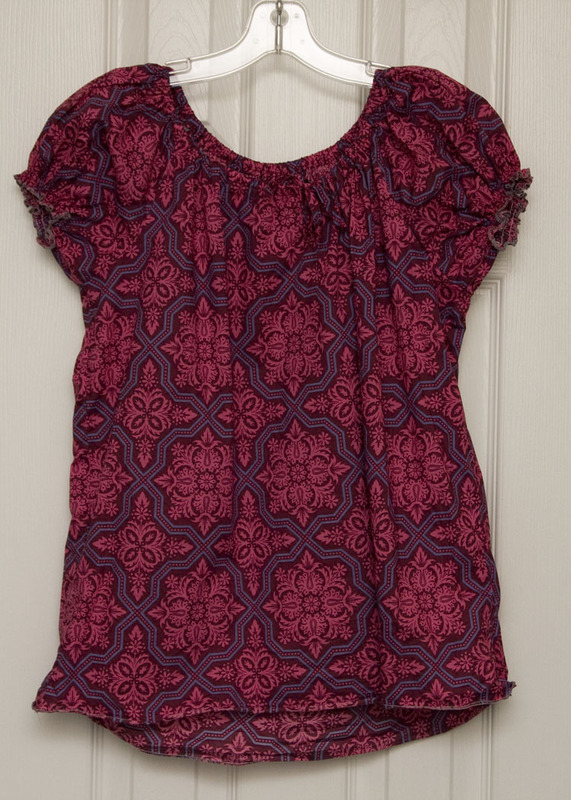 I have that same innocent crush print for a top, but I still need to decide on a pattern. Yours looks great! loving that orange skirt! and your blouse is adorable.